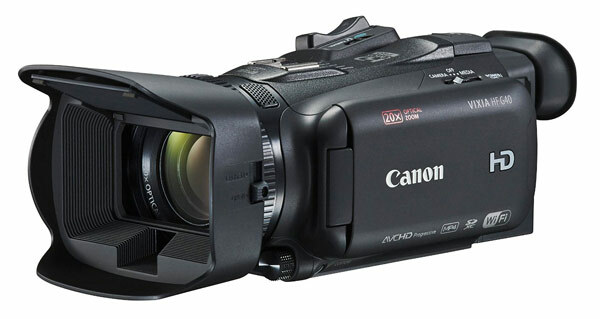 The Canon HF-G40 is Canon’s top of the line flagship of consumer HD camcorders. The G40 has a new sensor with Wide Dynamic Range Gamma and improved low light performance. Compact in size. Records video in full 1920 x 1080 Full HD (1080p). Records to SDHC/SDXC memory cards (camcorder has two memory card slots) The 20x zoom HD Video Lens delivers excellent image quality and low light performance even at full zoom. The Dynamic SuperRange optical image stabilization (keeps video sharp in low light, or when holding the camcorder without a tripod). The Large 3.5-inch high resolution OLED touchscreen is the highest resolution screen on a camcorder that we have reviewed. External Microphone Terminal with Manual Audio Level Control, Headphone Terminal, 3 megapixel photos and the new Digital DV 4 image processor. Included are advanced features such as an updated large 1/2.84 inch HD CMOS Pro Imager (better for low light) provides a wide dynamic range, AVCHD H.264, and has a true 24p Cinema mode. (native 24p) a 30p mode, and a new 60p (60fps) mode. External Microphone Jack for better sound options. The HF G40 records at up to 28mbps (the AVHCD best bit rate), or 35mbps using the new MP4 recording mode. At maximum quality , you can record about 2 hours and 55 minutes to a single 32GB flash card, or 5 hours 50 minutes if using both card slots. Canon’s Instant AF focusing system greatly enhances auto focus speed and accuracy and decreases the time to lock in focus (even in low light). The HF-G40 has an HDMI Mini Connector (output) for best quality when hooking this camcorder directly to an HDTV. Mini Advanced Accessory Shoe to add an external light or microphone. Dedicated manual focus ring. Built-in video light. Features a new larger higher resolution 3.5 inch OLED screen (with 1,230,000 pixels). Also included is a 0.24-inch color viewfinder (1,560,000 pixels). Remote Control Terminal (compatible with LANC protocol). Dolby Digital 2 channel (AC-3) stereo sound, or 5.1-channel (with optional Canon SM-V1 microphone). Cinema-Look Filter with 9 built-in filters. Built-in Wi-Fi® technology allows you share video files wirelessly to your PC or favorite social network using internet browsers, smartphones or tablets. You can remotely control key functions of your camcorder wirelessly using the Wi-Fi Remote control features. Slow and Fast Motion recording available. Mini Advanced accessory shoe for adding lights, microphones. Canon HF-G40 Dimensions: 4.3″ x 3.3″ x 7.2″ (2.0 pounds w/ battery). Smart-Review Commentary: Canon’s top of the line HD camcorder just got better. The HF-G40 features a new 1/2.84-inch HD CMOS Pro Image sensor for better low light performance and high dynamic range. The 8 blade iris provides smoother background images. A new improved detachable lens hood (which prevents light glare) is included as well as an improved larger eye cup, when using the camcorder’s EVF viewfinder. The viewfinder has 5x the resolution of most viewfinders with 1.5 million pixels. The Canon HF G40 uses dual SDHC/SDXC memory card slots for long recording times. The lens on this camcorder offers a wider 26.8mm field of view to get more of the scene indoors, and scenery shots outside, and doubles the zoom to 20x from previous models (but maintains f2.8 at full zoom). Double Slot Recording can record to two SD cards simultaneously as a safety backup. The Full HD CMOS Pro Imager uses fewer pixels, which are much larger and more light sensitive than the pixels of other camcorder sensors, which results in better video performance and dynamic range. The HF G40 is our best performing consumer camcorder in low light, especially with the new sensor which is the same used in the Pro XA30 & XA35 camcorders. A color viewfinder (EVF) is included. Viewfinders are disappearing on camcorders, so this is a nice feature to see, which can be used in strong sunlight when it is harder to see the LCD screen. A new feature is built in WiFi to allow you to share video or control your camcorder remotely wirelessly. The Touch & Track system on this camcorder keeps focus and exposure on any subject, no matter where it moves. Just choose your subject on the large 3.5-inch OLED touchscreen. External Mic Jack for enhancing your sound options, and headphone jack to monitor sound. Professional-quality 16-bit PCM recording is available for best sound quality. The Instant AF focusing system offers a dramatic improvement in auto focus speed and accuracy. Great for sports. The Canon HF G40 is a not only a SmartReview Top Pick for 2017 but has won our BEST of 2017 award for consumer HD camcorders. **The G21 model has replaced the G40 in 2018**.